Good Morning Folks, I hope you all had a very lovely weekend, apart from the rain and flooding!! Last week we met JenniTRX (Isn’t she lovely). Well she’s back today giving us her Top Ten Tips to Clean Eating! Check them out below. Hello Everyone, Jenni here, To help you try and understand what Clean Eating is exactly I’ve summarized the 10 main principles most people who eat clean try and stick to. They are a guide rather than a rule and you can be as strict or as lenient as you wish. Any questions please feel free to ask :)! #1 Eat a wide-variety of whole unrefined and unprocessed foods in a form that’s as close as possible to how the foods appear in nature. Whole foods are foods that haven’t been processed. So Instead of being made in a factory they come straight from the source like a farm (fresh fruit & vegetables, whole grains, lean meats, low fat or fat free dairy products, unsalted & unbleached nuts, and seeds). I try and eat local organic Irish produce as much as possible not only because I want to help the Irish food industry and farmers but also because we have some of the best standards in Europe when it comes to our meats, fresh fruit and veg. You honestly cannot beat a punnet of fresh Wexford strawberries. A good example of as close to Nature as possible is Apple juice. So you’d assume that apple juice, even your own freshly pressed version, is very healthy, well yes you’d be partially right is saying so. HOWEVER actually eating the entire apple is far healthier for you because instead of just using the juice and throwing away the pulp of the apple you are getting the following benefits by eating all of it. There is Fiber in the flesh, vitamins, minerals and energy in the juice, and powerful antioxidants in the skin. If you only have the juice you are consuming 1/3 of what an apple actually has to offer on a nutritional basis. Known as E numbers, added refined sugars and bad cholesterol laden Saturated and Hydrogenated fats. Unfortunately they are usually cleverly and purposely hidden by their Latin or chemical names. The fact that there are no “label police” or laws in Ireland allows foo companies to do so. I make it my goal to make myself familiar with them. Anything ending with “ose” is a sugar. (Lactose, dextrose, maltose, fructose) are just a few of many. Also if the list is particularly long and contains lots of ingredients that I can’t pronounce, I stay clear. 2) If I can make a home made version of it then I will always try that instead e.g. : Lasagna, curry sauce, Tomato ketchup, humus, burgers, pesto’s, chicken nuggets…. there’s pretty much always a homemade clean recipe for everything if you look hard enough. # 3 Eliminate refined sugar. Sugar is everywhere and not all of it is bad infact we need sugar to power our workouts, perform most daily activities and power our brains. ALL carbs get broken down into sugars at a monocular level; they become either simple or complex sugars. Simple sugars like table sugar (Sucrose), sweeteners in most processed foods and sweets (Dextrose and Maltrodextin), break down really fast in the body. This means that they cause a blood sugar spike or a rush of energy in the body, which can be swiftly followed by a “crash” later on. These crashes and spikes can cause a series of bio-chemical reactions in the body that eventually lead to fat storage. On top of this simple sugars like refined table sugar offer no health benefits, no nutrients or minerals other than being calorie dense. Instead Clean Eating suggests that you use sweeteners and sugars that occur naturally to sweeten your foods such as, fruits, Raw Organic Honey, Agave syrup, Brown Rice Syrup, Coconut Sugar, Barley Malt and Organic good grade Maple Syrup. Simple sugars are addictive the more you eat the most we get used to the flavor of sweetness, the more we need to be able to taste it. Fats in general have been given an awful name due to the “Low Fat” craze that took over most of the 80’s. This was a term before researchers realized that not all fat is Bad and infact we NEED Good fats in our bodies to sustain a healthy and long life. I find this the subject of fat in foods is most difficult for my clients to comprehend. Good fats that are high in monounsaturated and polyunsaturated are found in oily cold-water fish like salmon, nuts (especially almonds, walnuts and pecans), nut butters almond and peanut are my fav, flax seed, avocados, nut oils, and olive oil. Your body needs a certain amount of ALL three fats, Saturated, Mono and Poly in order to produce hormones and repair tissue. Fat also lowers the glycemic load (the rate at which carbohydrates release insulin into the blood) of foods, so when you eat healthy fats with complex carbohydrates, it slows digestion and keeps blood sugar and energy levels more stable. An example of healthy Sat Fats are Organic Free range Eggs. 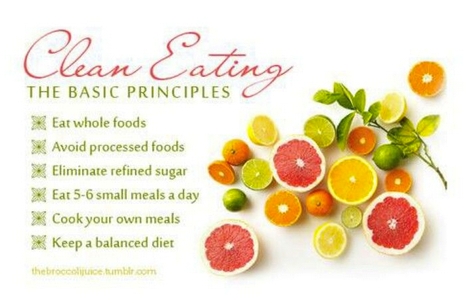 Clean Eating tries to ensure that you are getting the maximum nutrition and balance in all of your meals. This in turn will creates energy, the feeling of fullness and less hunger, and eventually, increased fat loss. Combining these macronutrients creates a synergy between the food itself and the phytochemicals found in them, which together increase the impact of antioxidants in the body. I love that clean Eating is about flexibility, unlike other fad diets that limit one or more food groups. So while it encourages always combining complex carbs, lean protein and healthy fats, you can mess around with your ratios to find the combo that works best for you. – You start to only eat what you need during that meal to last you for 2-3 hours until your next meal. This discourages people from overeating vast amounts of food and calories that they don’t actually need at different times of the day and teaches you about portion control. – You have more Energy. Eating smaller meals, more often, helps to keep your blood sugar levels stable, which prevents sugar crashes. Blood sugar spikes also encourage excess calories to be stored more readily as body fat, so when you keep blood sugar stable, it can help you lose fat or at least maintain leanness. – It takes energy to digest food. Eating more frequently can have a positive impact on your resting metabolic rate. Which in turn means you burn fat at a higher rate. – I do a lot of weight and resistance training in the Studios esp. on the TRX machine so it is important that I always get a healthy variety of my Macro- nutrients (Fats, proteins and Carbs) Reducing my body fat percentage, while building muscle, requires food — and your muscles NEED carbs, fats and protein to recover and grow. By consuming food every 2-3 hours, you always make sure there is enough energy available to fuel recovery. #7: Avoid “empty” calories found in fast food, soda, snacks, cakes and cookies, and substitute in nutrient-dense homemade snacks. With the exception of my “Treat” meals, which I make sure I have, because life is just way too short not to have Ben and Jerry’s in it. I still try and avoid fast food, fizzy drinks, and cakes like the plague. To me they are just empty calories that could be better used elsewhere. Empty calories will usually have very low fiber, high carbohydrates (especially sugars), high in fat, and low in protein. They will also often list either sugar or white flour as one of the first ingredients on the label. When I fancy a cake I will make a Clean healthy homemade version. The same goes for Chinese food infact my family actually prefer my versions of they’re fav Chinese dishes to those from the local take away and it’s a fraction of the price. 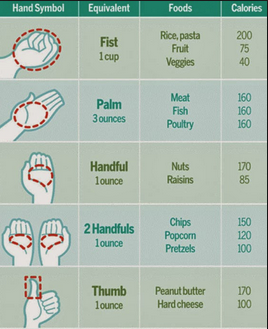 #8: Watch your Portion sizes. Clean Eating isn’t a Free for all at the buffet Table though and depending on your desired goal (weight loss, building muscle mass, lower body fat but staying lean…) you will need to vary your portion sizes accordingly. When it comes carbs esp. the likes of brown rice and quinoa the golden rule I run by is one handful of it UNCOOKED per person. Below is a helpful chart I try to stick to when I can. #9 Drink LOTS of Water. Most people walk around every day in a dehydrated state. Adding certain foods and activities to this day further dehydrates you and causes tiredness, concentration levels to drop and a variety of other health problems. Drinking water will keep you hydrated, aid in digestion, improve your concentration and energy and can help you feel fuller over the course of the day. Drinking water instead of empty calories like fizzy drinks can decrease your overall calorie intake for the day. This is one of my favourite rules for oblivious reasons. Whilst some absolute clean eating purists would never stray off the path, I personally feel that life is too short to not have the odd piece of choc, have that scoop of peanut butter cup in the Cinema, the odd few chips or a cocktail with my ladies. I absolutely LOVE love love Veronica’s crisps on my Treat days because I don’t feel like I am being bold at all. The sharing bag is great for the cinemas and I particularly love them if I am craving crisps or Salt after a night out. I guarantee you as you go begin to progress down this Clean Eating route what you used to consider a “Treat” will begin to change. Due to the fact that I eat so clean when I do eat something processed or greasy I really feel it afterwards, and usually don’t feel great which puts me off. My taste buds have changed so a can of coke or a bar of dairy milk are extremely sugary to me so much so that I couldn’t finish either, a sip or a piece will be enough to cure my pang. I often make my own Treats, which usually consist of slightly bolder healthy foods like adding coconut milk to my curry instead of Fromage Frais, making Eaton Mess (my FAV meal ever) from scratch or a clean chocolate cake. So that’s it folks, my ten principles on clean eating, not to scary is it! Tomorrow I’m going to discuss why I myself eat clean, the benefits from it, and how to get started :)!! Hope you enjoyed todays blog and I hope to see you all again tomorrow <3! Hi, I would love to eat clean but honestly I find it very hard to know what to eat. Breakfast is the most difficult one for me as I always find myself eating those cereals which are full of sugar and salt and toast. I just don’t know what to eat instead in the mornings. Would you have any ideas for meal plans or recipes for your clean eating? Hey guys this really is a great read. In the last year iv really tried watching what I eat and I have really gotten into training hard. I kinda know the foods I should be eating but it’s what to do with the ingredients is where I am hopeless. Jenni always posts some really good ideas, and I wonder where she comes up with them. Have use any recipes or either a decent website where I can get recipes for meal ideas with real foods. Also like yourself jenni I study part time and it’s when I get to college I really want to snack on the chocolate or when I’m driving home? I could really do with some help with how I can minimise my sweet intake, I always feel the need for sugar. I want to start eating clean but I’d like a menu guide or recipe guide where can I get that?